Venezuela remains on edge after in the pre-dawn hours of Monday morning a small group of soldiers attempted to launch a military coup against the Maduro regime, but failed, resulting in the arrests of 25 members of the Venezuelan National Guard who temporarily gained control of a police station located a short distance from the presidential palace in Caracas, and the apprehension of two others at another location, in total 27 detained — all of which sparked riots in local neighborhoods, some of which appear to have continued throughout the night. Following the mutiny and subsequent successful government crackdown, which further involved the rebellious unit briefly kidnapping several officials and stealing weaponry in the Cotiza neighborhood, pockets of anti-Maduro protests were sparked in the capital city demanding the release of the detained soldiers, whose actions the government condemned as "treasonous" and "motivated by the dark interests of the extreme right," according to a statement announced on state TV. Maduro's right-hand man, Diosdado Cabello, also boasted on Twitter while speaking of the rebels: "They were neutralized, surrendered and captured in record time." International reports suggest some of these initial protests were snuffed out by riot police, but sporadic clashes continued in some places through the evening. But the socialist country, currently suffering from what's being widely described as "inflation approaching 2 million percent" and a shortage of everything from food to medicine to diapers and baby formula, remains on edge as opposition leaders are now calling for mass protests in the coming days in the wake of the defeated attempt at triggering a broader military revolt. Clashes appeared ongoing through the night in the neighborhood in which the military revolt began. Specifically, opposition leaders in the legislature have called for nation-wide protests to be held Wednesday following the government-stacked Supreme Court declaring it would throw out recent measures by the National Assembly that declared Maduro's presidency illegitimate. But thus far the brief military uprising appears to have been a very isolated event as the officers involved are low-ranking with little sway to start a domino effect of defections, which would have to dent the higher ranks first. The televised government statement following the arrests emphasized that the military remains loyal to the state with the words, “The armed forces categorically reject this type of action...". 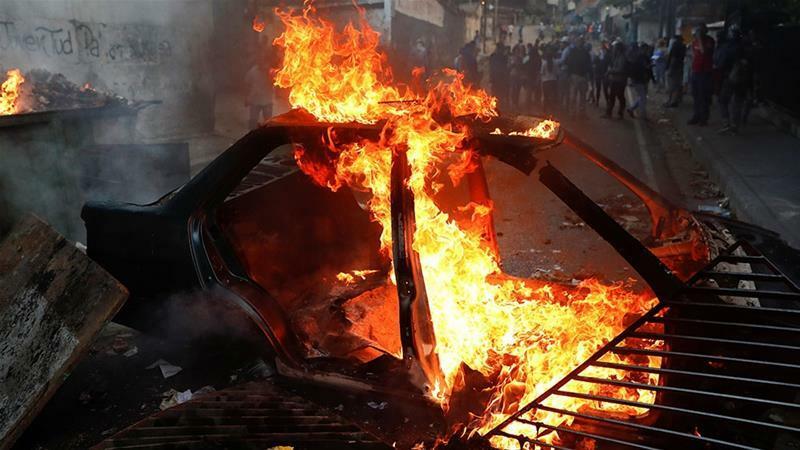 Unconfirmed videos circulating on social media throughout Monday evening appear to show citizens erecting barricades in Cotiza and possibly other neighborhoods while setting fires to objects amidst a continuing police crackdown seeking to tame the unrest. But the unrest could grow as opposition congressional leader Juan Guaido becomes bolder in his denunciations of Maduro. Throughout the night their appeared intermittent violence on Caracas' streets between protesters, police, and what some say are the "colectivo armado" — fiercely loyal pro-regime militias that typically move in packs on motorcycles targeting anti-Maduro opposition activists. Earlier this month Guaido was arrested and briefly detained by secret police following a speech wherein he implied he was the only legitimate authority in Venezuela. This comes after months of both the Trump administration and US Congressional leaders becoming increasingly unrestrained in publicly calling for outright regime change. After Monday's coup attempt Florida Senator Marco Rubio went so far as to encourage more such military defections. Rubio claimed military forces have been deployed to the streets amidst protests and internet access had been cut across parts of the country. Monday's short-lived mutiny was not the first time the Maduro government has faced military insurrection. There's been a series of significant incidents over the past few years, including last August's explosive-laden drone attack as Maduro addressed a military parade in Caracas, and a firefight between three rebel military members and security forces at Fort Paramacay in the northern city of Valencia in 2017. Perhaps the most extreme and notable attack came in June of 2017, when ex-policeman Oscar Perez dropped grenades on the regime loyalist-dominated Supreme Court while flying above in a stolen helicopter.